Hoshi Corporation, the Tokyo-based OEM and ODM cosmetic company, has received a license from the Okinawa Regional Customs to operate Japan’s first bonded cosmetic factory. The company is strongly geared toward exporting OEM and ODM cosmetic products with its logistics base in Okinawa, as driven by growing international demand for made-in-Japan cosmetic products, mainly to Asian and Oceania countries. Currently Hoshi has been dealing with over 700 overseas clients. The bonded cosmetic factory operation license has enabled the company to fully use its high manufacturing technology and quality to reduce costs and realize swift production, thereby offering you affordable manufacturing plans thanks to reduced tariff and storage costs. 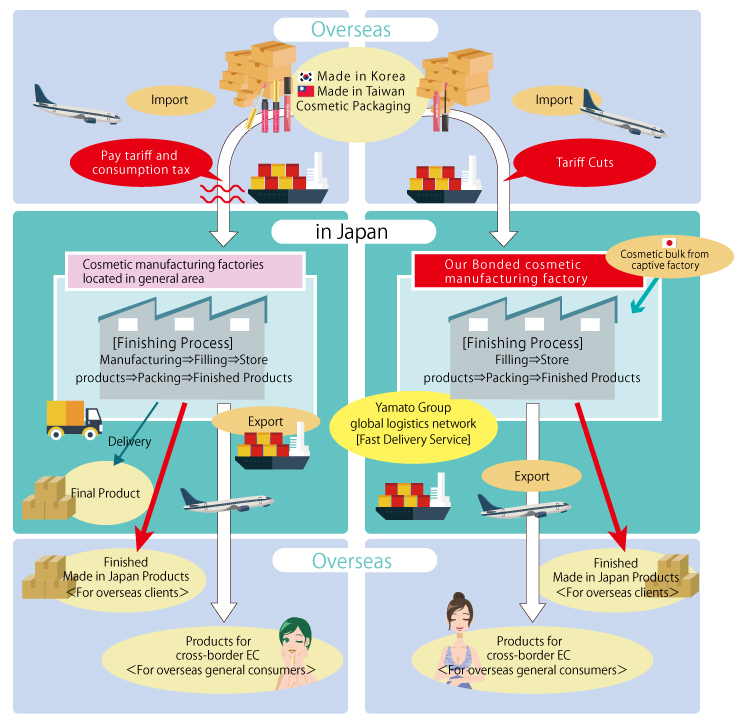 The Okinawa factory is located in the Global Logistics Center (Okinawa GLC) that is operated by Okinawa Yamato Transport Co., Ltd., a subsidiary of Yamato Holdings Co., Ltd., a major player in the logistic industry in Japan. By operating the bonded factory in the Okinawa GLC area neighboring Naha International Airport, Hoshi can undertake filling, packaging, assembling operations and store materials in the bonded area. You are NOT required to bear import duties imposed on cosmetic packages. The Okinawa factory is adjacent to Naha International Airport, allowing the lead time of import and export to be reduced. Make use of the global network of the Yamato transportation group, the largest logistic company in Japan. High quality is assured by manufacturing under the Japanese GMP. Product storage inside the Okinawa GLC is available at low cost. Hoshino supports cross-border e-commerce business by utilizing its logistic facility as your business hub. Transfer cosmetic bulk to Okinawa factory from Hoshi’s domestic cosmetic manufacturing factories. Import Korean or Taiwanese cosmetic packaging. *Selected high-quality Taiwanese and Korean packaging can be imported at preferential tariff rates. Fill cosmetic bulk into imported containers. Export to your clients/agents (a third country) without custom clearance.